CHS Re:Take | When will the 27,500-day streetcar service delay end? As I sit here writing, we are just a few days from “Streetcar Safety Day” and it will be a few more until you read this article. 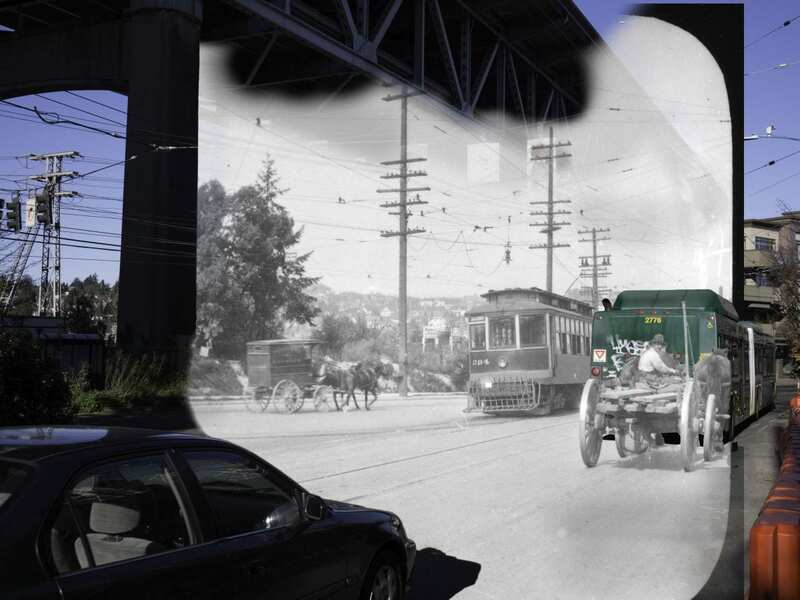 So you may feel it is a bit risky for me to cast my voice ahead and claim that this is yet another chapter in my pledge to write a streetcar history article each month until the much anticipated and long delayed opening of the First Hill Streetcar. Well, is that man above in 1913 worried about driving his horses into the back of the number 49 bus? No, he is staring back at you, right through a rip in the fabric of space-time, right into your soul, and the horses have ceased to exist to him. And so it is with me. I will blindly whip this wagon right into the back of a pastel, cherry-blossom adorned streetcar in the public interest of a shared understanding of our streetcar past. If you’re new to this, bookmark these pages and catch up later. Almost nine years ago I returned from Seattle on business and mused about the simmering plans for a streetcar on Broadway. To read about it you’ll have to visit my old website which is hated by Google and gets almost no traffic. Probably not worth it. A few months later on CHS, I wrote the only history of Seattle’s 1906 attempt to create a municipal streetcar system as background to the history of service on Summit and Belmont (now the 47). Here we go. Back in October I was fed up. At about 9th and Cherry, gasping for breath after trying to run up First Hill yet again out of sheer boredom, I thought, how much longer will I have to struggle up this gall dang, cursed hill — this profane hill — let’s call it Profanity Hill — from work each day instead of taking the streetcar that I was promised? I mean, we were promised hover boards and flying DeLoreans, but I thought we settled for that streetcar? 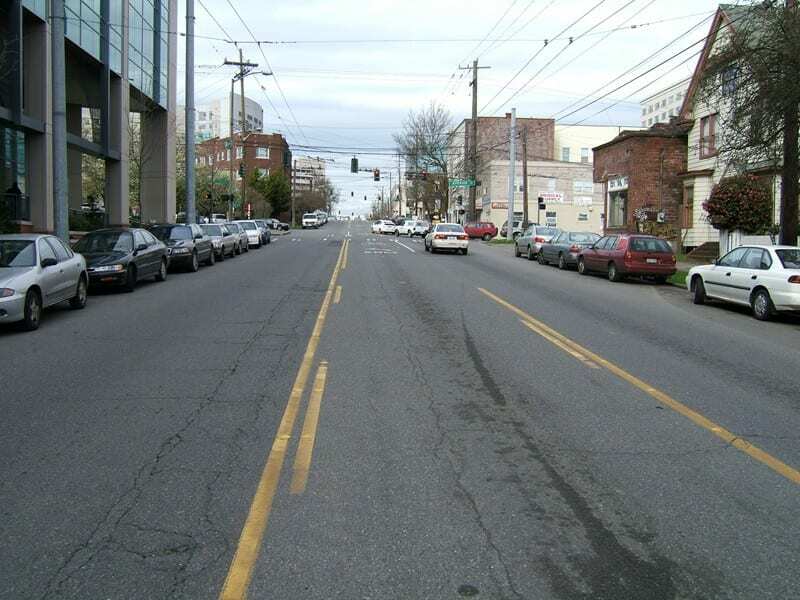 So I challenged SDOT and Sound Transit to a duel. If they put in effort and opened the line quickly, I would put in no effort and not write about streetcar history. But, if they put in no effort and took a long time to open the line, then I would put in tremendous effort and write a streetcar history article every month on CHS. I did the first one intending to focus on two streetcars on Broadway but accidentally wrote about the Booth Building quite a bit. 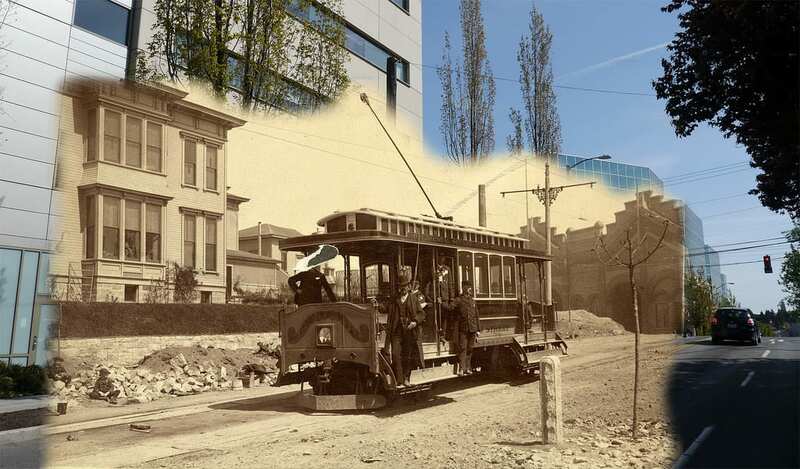 Do you know how difficult it is, though, to see a streetcar in an old photo and figure out exactly where it was going? There are very few resources to tell you what exact streets the lines plied in any particular year. The ratio of minutes researched to words written was something like 5:1. The transit agencies said nothing about timing for when the line might open in October. Well played. So in November I was forced to write again. A Capitol Hill streetcar at 15th and Mercer was my subject. This time I really researched streetcars, but I took it too literally and spent a bunch of time browsing the online listings for the St. Louis Car Company at the Washington University archives and emailing them to hopefully someday (hello can I get a reply?) get assembly line photos of that exact streetcar. Also I obsessed over whether the photo was actually 1913 and found the block on a bunch of old maps. I keep forgetting that I’m writing about streetcar lines. You might think that Sound Transit or SDOT would have taken an interest in my writing by this point. You’d be wrong. Instead, they tried to shut me up by getting ready to open the streetcar line. So I’m getting this one last article out as quickly as I can. That’s our topic. 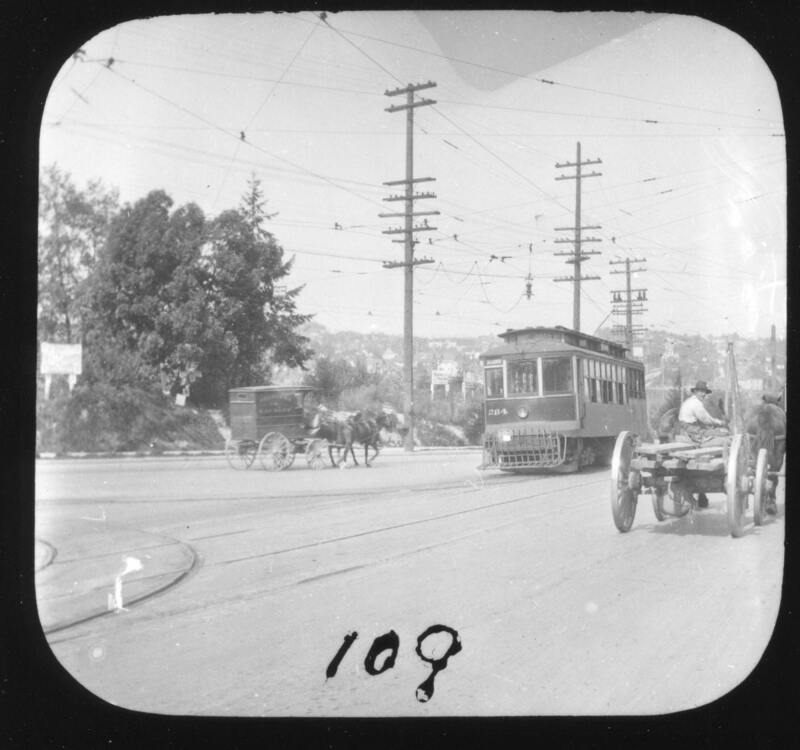 The lead photo shows a streetcar turning from Eastlake Avenue North (now Eastlake Avenue East) to head up Harvard Avenue North or East or whatever is accurate in the time frame you’re discussing. As you may have already read, but probably didn’t bother, the Broadway streetcar opened in 1891 as part of the Union Trunk Line company’s 5-line system, heading from James Street to Lynn Street. After acquisition by Seattle Electric Company in 1899 It was converted from narrow gauge to standard gauge. It was rerouted down Pike Street in 1903, no longer connecting with the James cable at the James Street Powerhouse. Some of us remember the occasional number 7 (now 49) bus with an “Aloha” destination placard, and that shortened terminus may have brought back memories to 90-year-old riders back in the 1980s. They would need to be that old because it didn’t take long for SEC to extend service. In 1905 the Seattle Electric Company built tracks on newly-graded Harvard Avenue from Roanoke down to Eastlake. This gave Broadway direct service to the new campus of the University of Washington, part of SEC’s massive political gambit to convince voters not to create a municipal streetcar system. (Spoiler: it worked.) Today the 49 makes the trip over the ship canal on the University Bridge. Back then it wasn’t a ship canal (the locks were built a decade later) and the tracks were added to the bridge to Brooklyn, no-joke called the Brooklyn Bridge, which was a bit further west. Look here is a map from Wikipedia, to prove I am not trying to sell you something. The Brooklyn Bridge over Portage Bay. Credit line: “Seattle map – Sanborn Perris 1893 – U. District v3” by Sanborn-Perris Map Co. Limited – Key map, Seattle, Washington 1893 Volume 2, Sanborn-Perris Map Co. Limited, New York, (1893). Licensed under Public Domain via Commons. This happy arrangement lasted about 35 years. Streetcar service ended in 1940, replaced with trolley buses. On May 12 the streetcar was cut back to the south end of the University Bridge, with passengers transferring to motor buses running on Eastlake. September 1, 1940 was the last day that streetcars carried passengers on Broadway and down Harvard Avenue. On Streetcar Safety Day it will have been 27,487 days. They were replaced by motor coaches for almost a month while new trolley bus wire was hung. On September 29, 1940 trolley buses began running on the #15 Broadway route. This entry was posted in News, etc. and tagged history, retake, streetcar by Robert Ketcherside. Bookmark the permalink. Let’s add value to your weekly posts. You should note what the mounting penalty for the delayed service has tallied. I haven’t heard, but something makes me think this thing got capped long ago and the Czechs are using to pay any more beyond $X. Thanks for the comment! You might email chs@capitolhillseattle.com to make sure Justin sees it. If you’ve got any questions or feedback about streetcar history on the hill, send them my way. There seems to be confusion about CHS. Last week there was an irate Twitter thread where the OP seemed to thing this blog has an editorial board. Nope, just Justin. On the flip side, you addressed me as if I am the website. Nope! I just write history now and then for CHS. Actually there are a bunch of people that write for CHS. I suggest checking the byline. Maybe you’ll discover a new favorite writer! Don’t call it so soon Rob, I think SDOT actually HAS taken notice of your street car series, but just doesn’t want to admit that it’s the real reason they keep coming up with all these delays. Seriously, just wait for it, they’ll sneak in a new delay at the last minute, just so they can squeeze another article out of you. Maybe I’m wrong, but either way, at least we’ll all be experts on Seattle streetcars when this fiasco is all said and done.